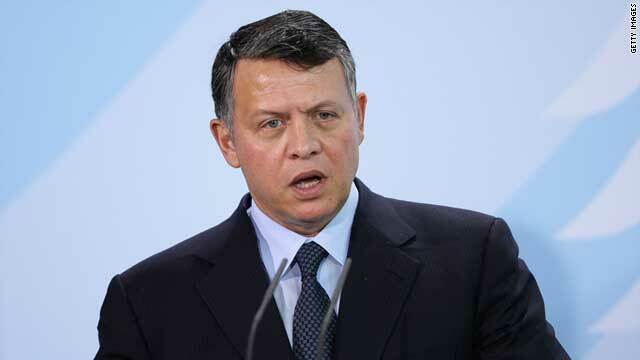 King Abdullah II said Jordan is proceeding "in earnest with the political reform process." Amman, Jordan (CNN) -- Jordan's King Abdullah II has made a call for national unity and reform following bloody clashes between protesters and government loyalists late last week, the country's Petra News Agency reported. "What matters to us in this stage is that our national unity must not be undermined," the king said Sunday, while visiting the southern region of Petra. "We are proceeding in earnest with the political reform process and we have nothing to fear." The assurances from King Abdullah came two days after Friday's clashes left dozens injured and as opposition groups continued to demand the resignations of the country's prime minister and senior security officials. "We recognize the difficult conditions and challenges the Kingdom and the whole region are passing through," the king said, "but we are optimistic about the future we seek through developmental and economic projects." The demonstrations turned violent as government loyalists clashed with protesters calling for the dissolution of parliament, an elected government and constitutional reforms. Dozens were injured as the two sides converged in a hail of rocks and swinging sticks, according to protest organizers and the government. At least 62 people and 58 security force members were injured, the country's General Security Directorate said. One man died of a heart attack in Friday's protests, officials said. Among those calling for the dismissal of government officials were family members of the 56-year-old protester. We recognize the difficult conditions and challenges the Kingdom and the whole region are passing through. The brothers and sons of Fakhri Jamil blamed the heart attack on beatings they say he sustained from security forces and "thugs." Meanwhile, Jordanian Interior Minister Saad Hayel Srour and Gen. Hussain al-Majali, the head of Jordan's Public Security Department, told reporters Saturday that gatherings such as Friday's, which occupy a main area and disrupt day-to-day activities, will not be tolerated. Security forces have allowed peaceful protests in the kingdom for more than 12 weeks, the two said. Al-Majali said security forces should not be accused of any shortcomings or negligence during Friday's protest, noting that had they not intervened during the clashes, "today we would have had funerals that cannot be counted." He said the forces practiced restraint and intervened only to prevent bloodshed and save citizens' lives. A CNN team in Amman on Friday witnessed some security forces beating up anti-government protesters.